I have been using my portable hard disk drive for more than an year now. Its a laptop hard-disk of 2.5 inches, 80GB capacity with a USB 2.0 casing. By now the drive has become nearly full, there is little free space. For a moment I thought that disk is going faulty, but with some hit and trial, I got it fixed. Let me share the solution with you. 1. 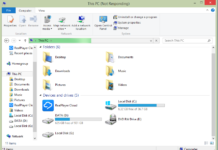 Delete some un-necessary stuff from your drive and make at-least 5% of the total disk space as free space. See this post in case you need more details. 2. 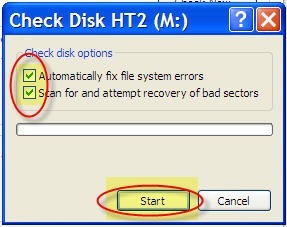 Open My Computer, right click on the USB drive, click on properties. 3. 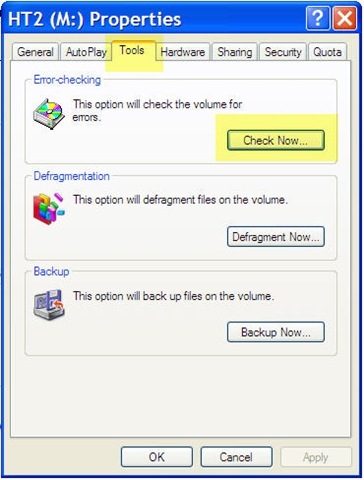 Go to Tools > Error-checking and select option to check now as shown in the image below. 4. This will show a window like the one below. 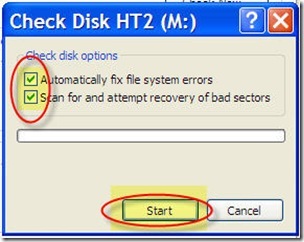 Check the check-boxes to Automatically fix the file system and Scan for and attempt recovery of bad sectors. Click Start. NOTE: If you are not able to run this scan, disconnect the drive and try again. 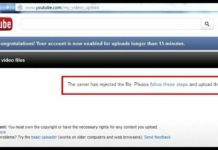 If the USB malfunction error is received, see this post for solving it. This scan may take a few minutes to a few hours depending on the disk size and type of file system. Keep patience and let it complete properly. Once this is done, re-start your computer. Thank you so much for posting this. I thought everything on my harddrive was going to be gone. I had hopes, but mine starts the scan then says it cannot complete and stops. Thankyou. This helps me to solve my problem. I am using Transcend T.Sonic 610 MP3 Player. 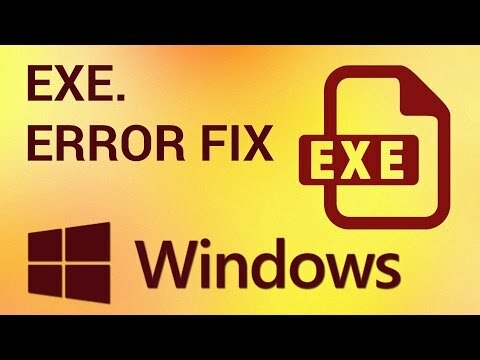 When I connect it to computer it gives the same error, and even I cant open My Computer, Start Menu or any other applications while it is connected and as soon as i disconnects it from the computer all the applications starts properly, My computer gets opened, everything works fine. I cant find the proper solution please help me. Thank You. I am experiencing the same problem (and same message) with my new 1TB ‘My Book’ USB drive. I only have 6GB used of 931GB available (I should point out that I have no trouble with my other 7 external drives ranging from 120GB to 500GB). You are correct in the time frame of how long it will take to implement the solution you provided. It took about 7 hours to do my 1TB drive. 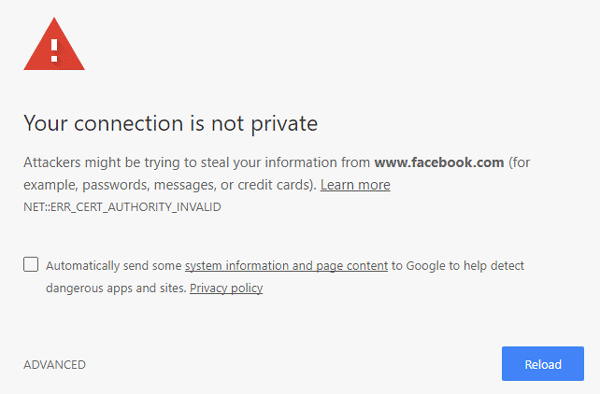 People should be aware of the second part of the error message that states it could be a failure of the connection (network). I have been unplugging the USB cable, waiting a few minutes, then plugging it back in and everything was fine. I’m only trying your suggestion to see if it stops me from having to “pull the plug” every few days. I have a feeling it won’t… BUT, Not because there’s a flaw in your fix… But, because my particular problem strays from your original cause. hey, my pendrive still have same problem. can anybody help me. I had this warning when I added a another HD (IDE) to my PC and instaled Windows 7 Beta.The first HD was Sata.The drive (IDE)would give a warning each time when I try to copy from it using USB external HD or Pendrive even to the internal Sata drive. of data.After changing the IDE cables with a faster transfer of data it worked fine. hope this might help someone.Thanks. i have a wireless modem from BSNL WLL connected to my pc through usb connector, & driver for the sme installed on my PC correctly but when i connect through this modem it connects but i am not able to browsc the pages & after some time the same will disconnect. Request you to kindly give me the solution for the same becasue i am helpless to solve this problem. My usb hard drive drive drop’s a connection every 20 min. or so with the connection failed warning…. It could be many problems. First check your usb cable and usb port to make sure it’s seated into the slot. If the cables are good. try a different usb port, better if its on a different board. If it still drops like mine I’m switching out hard drives in the external case itself and see if it will hold a connection. Hi this is Binay. 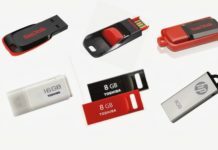 I have some problem with my 2GB kingston pendrive when i am going for format than it will show “write protected” same condition is there when i am going to copy and paste in pendrive. Please send me correct solution for that. 5)contacted seagate and reported the varioius error messages found in the log. Seagate had me uninstall all of the seagate software on my laptop reboot and reinstall all of the seagate software. So far all of the above has not corrected the windows – delayed write failed. Windows was unable to save all the date for the file E: |Mft. The data has been lost. This error may be caused by failure of tyour computer hardware or network connection. Please try to save the file elsewhere. When I have the delayed write failed I usually cannot go through remove hardware as the drive continues to spin. I have to pull out the usb cable. I also close any programs like itunes that I was using to save files onto my esternal drive. I run disk clean up and start all over again. I do not know how to correct the problem of the delayed write and would appreciate any information. Also I have automatic backups of my laptop hard drive which is about 75 GB. I sometimes delete all the backup files and let it backup again. This too has not altered the problem as with a temporary increase of 75 GB in free space the problem occurs. I had the same issue with my EXT usb 80 GB (not full) a few years back. I just replaced my USB cable and that fixed the isssue. My pendrive data was there – a check on properties indicated used space of 1.25GB and free space of 621MB. But, somehow, when I go to the pendrive directory, no files are found. Anyone knows how to solve the problem? i can’t even right click ma penndrive.If i do so,explorer.exe task ends up…..pl.giv me a solution. when i have tried to check it’s do not show the processing bar and close the error fixer window. please tell me that how can i solve this !!!!!!!!!!!!!!!!!! i had the same probs. i followed your steps but still the problem is not cleared. open your external hard drive, take the actual hard drive, and make it an internal, it was easy, and it worked like a charm. I have the same problem with Sumeet, is there any other way to solve this problem? 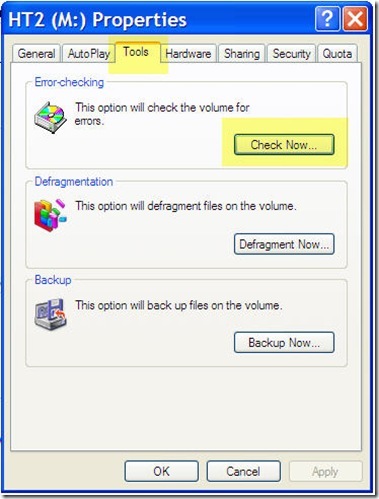 I cant scan, defragment and check for error. Please help me!!! 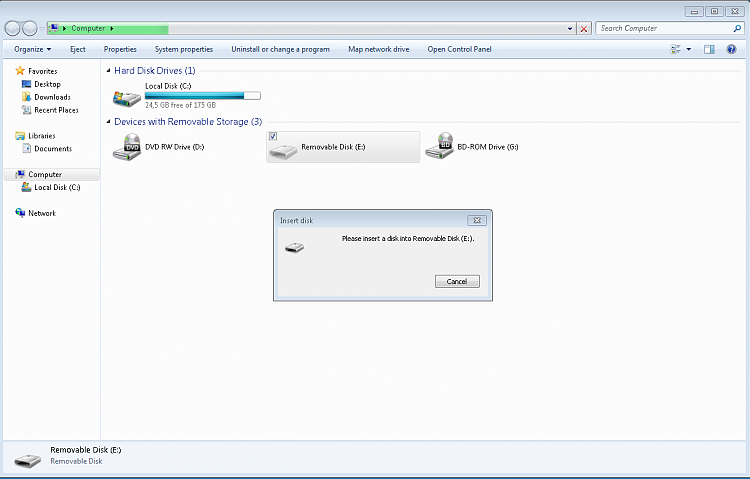 I had this problem with an HP Simple Save external hard drive on an XP SP 3 system. Two things seem to fix. 1. Uncheck Enable write caching on the C: drive (properties, hardware, policies). 2. I have two usb ports on the front of my Dell. One is used for the Simple Save; the other for an HP Photosmart printer. I turned off the printer when doing backups to the external hard drive.